t*rexes and tiaras: K+S Show Haul.. 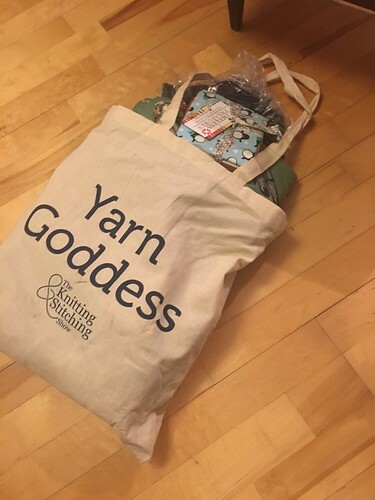 So, I mentioned when I wrote about the Knitting and Stitching Show that I'd share my purchases very soon. Finally remembered to take some photos of the things I bought, and thought it would be nice to share my plans for them, too. I don't know whether this will make me feel more "accountable" for these projects and less likely to put them off, but it's got to be worth a try, right...?! The press passes we were sent made us eligible for a little gift bag full of goodies from the show, which was useful for me as I'd of course forgotten to take a shopping bag with me. 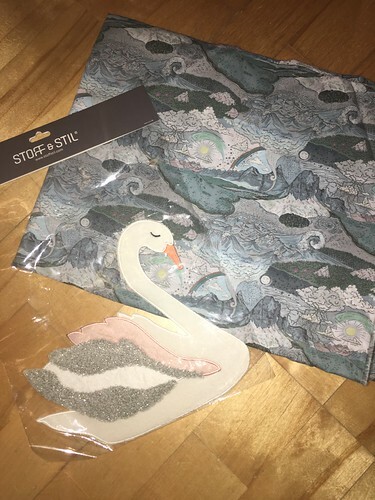 The only thing I purchased from Stoff & Stil was this pretty, sparkly swan patch. I think it irons on, but I'd probably stitch around it too. I have visions of it being on a skirt, inspired by this Boden one, but something which would flatter my shape a little better. This Liberty fabric is just a lovely print, of mountains and clouds and rainbows. It's called Weather Wonderland and was from Fabrics Galore. I think it's destined to become a Sew Over It Betty Dress...if I have enough for the skirt.. I do love Eternal Maker - they always have a lovely stall with some impossible-to-find-anywhere-else Japanese imports. Sarah spied these shifty creatures before I did, but as soon as I'd seen them I had to grab a couple of metres. I'm thinking an Emery dress with short sleeves. 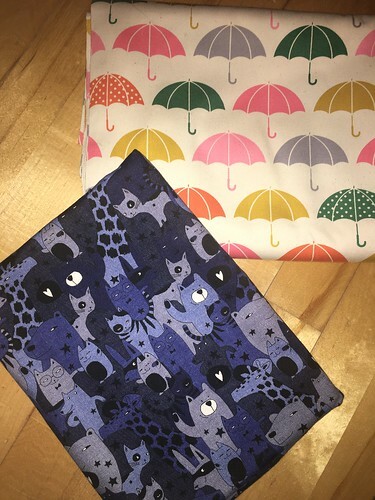 The umbrellas are a kind of canvas - perhaps I'll be brave enough to try a Cleo pinafore, but I suspect it's more likely it will become a pair of Turia dunagree shorts. I knew I wanted to find something vaguely sewing related to use to cover the top of the sewing box stool I bought recently. This canvas weight fabric was super reasonable so I really have no excuses to put off transforming this...over to Google to figure out where to start. Oh, these zombies are so awesome and I want them to be a 2444, probably. Maybe with a grey Peter Pan collar. I'm loving the idea of collars lately- this cactus print, too, might end up being another 2444 (I'll be all set for #OWOP with all these 2444s!) with the shawl collar addition. I did buy some other things, too, but they're for Xmas presents and therefore can't really be shared. But this is plenty to keep me going. Eep. I absolutely love the Swan and the material is all great. Look forward to seeing what you make. 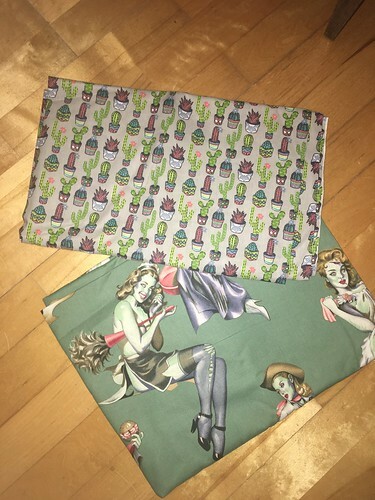 Thank you- after going through a bit of a lull, I'm feeling super inspired to sew, lately. Umbrella print Turia dungarees would be so cool! 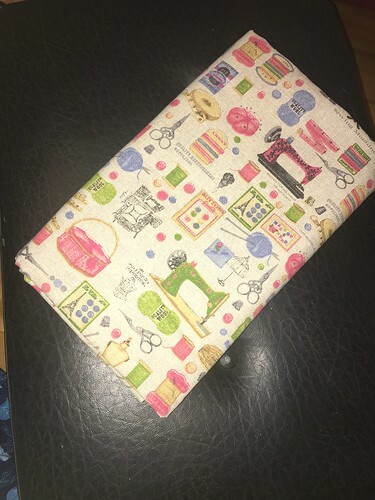 Also love the sewing themed fabric for your stool. Yes, I think that umnbrella Turia might be the way to go..